Camerawoman Sue Gibson captures an intimate moment with Maria and Honey Bun. Editor’s note: Victoria Bromley’s film, The World’s Most Wanted Animal premiered on PBS on May 23, 2018. 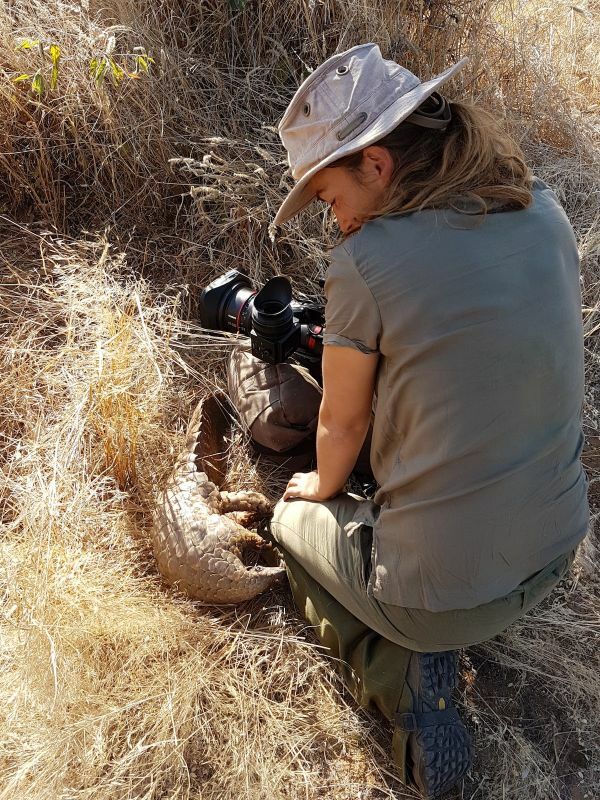 Below she gives some insight into what led her to the project and the plight of pangolins today. I first became aware of Maria Diekmann and Honey Bun when I saw a short film that Sanne [Sanne Christophersen, Assistant Producer for The World’s Most Wanted Animal] had shot with them in 2016. Maria’s expertise and passion for pangolins was undeniable, she was putting her own safety at risk to rescue individual animals from being sold into the black market. It was clear she would be a powerful central character and her bond with Honey Bun would offer us unparalleled access to explore the behavior and personality of this little-filmed creature. To understand why Honey Bun, an African Cape pangolin, and her species are so under threat we needed to explain the extent of the international illegal trade. We wanted to address the global crisis and the potential extinction faced by all pangolin species. When I began research for the film I was struck by how little studied pangolins actually are. Shy of humans and difficult to track, they are extremely challenging for scientists to monitor in the wild. A Google search for “how long do pangolins live?”, returned the answer “it is unknown how long pangolins can live in the wild.” The fact that there are no estimates for how many pangolins are left in the world was especially disturbing, as we started to grasp the scale of the illegal trade. Honey Bun, like many pangolins Maria has observed, has a rather unpleasant guilty pleasure – rolling in manure! This could be a way to disguise her scent. The crew could not interrupt Honey Bun’s daily routine of walking in the bush, so they would have to carry all their kit and follow her on foot. We studied data collected by TRAFFIC and began monitoring news reports on pangolin trafficking, which were alarmingly frequent. For myself and researcher Harry Lawrence, sharing our findings often felt like group therapy. Increased protections for pangolins recently introduced by CITES (in 2016 international trade in all eight species was made illegal) seemed to be leading to more action by authorities and 2017 saw some of the largest seizures of pangolin contraband on record. It was also clear that there was a considerable fight for pangolins underway. While customs agencies in Asia are stepping up their game, organizations like Save Vietnam’s Wildlife are working tirelessly to rescue and return pangolins to the wild. A high-profile campaign, by the charity WildAid featuring celebrities like Jackie Chan and Angelababy, aims to reduce the demand for pangolin products in China. This felt like a really important element if we were going to tell a well-rounded, honest story. Save Vietnam’s Wildlife are world leaders in pangolin rescue and rehabilitation. 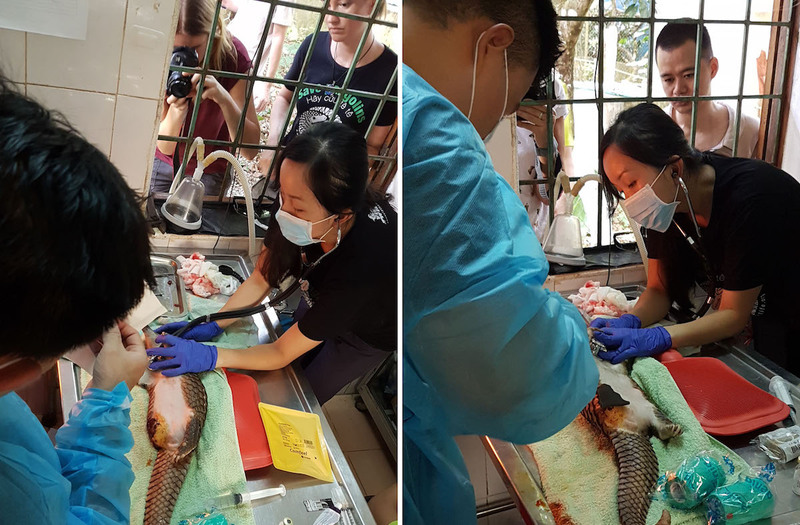 The crew filmed for several hours as vets worked to save a young male pangolin who’s leg had been severed, most likely by a snare. It is easy to dismiss Traditional Chinese Medicine (TCM) as a cruel industry, not supported by modern medicine, while forgetting that many people in the West swear by homeopathy and other scientifically unsupported cures. Pangolins scales have been used as a remedy in China for centuries and demand for scales, imported to China illegally, continues. But we wanted to show how attitudes to TCMs are evolving and how a younger generation is leading a change in attitude and dispelling common misunderstandings about products made with wild animals. 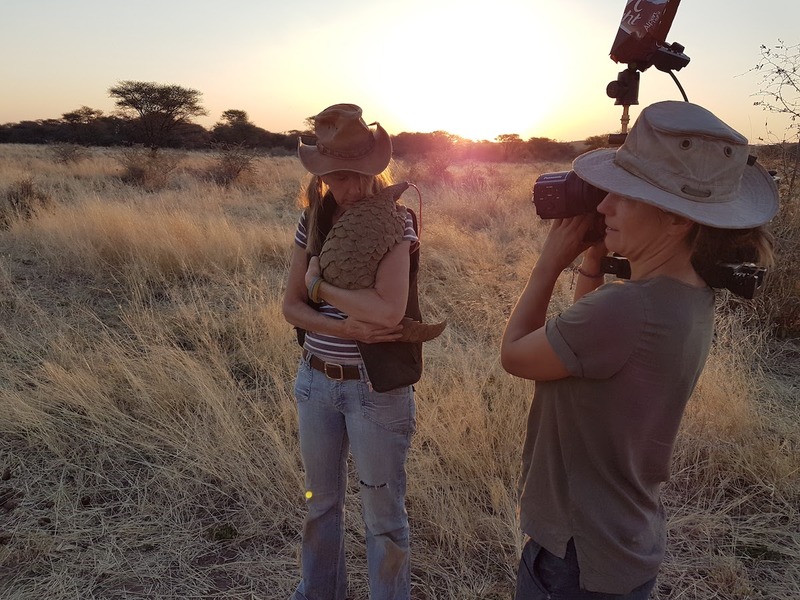 While we spent over a month filming in Namibia, we had only a short window for filming in Asia; Maria could not be away from Honey Bun for too long. 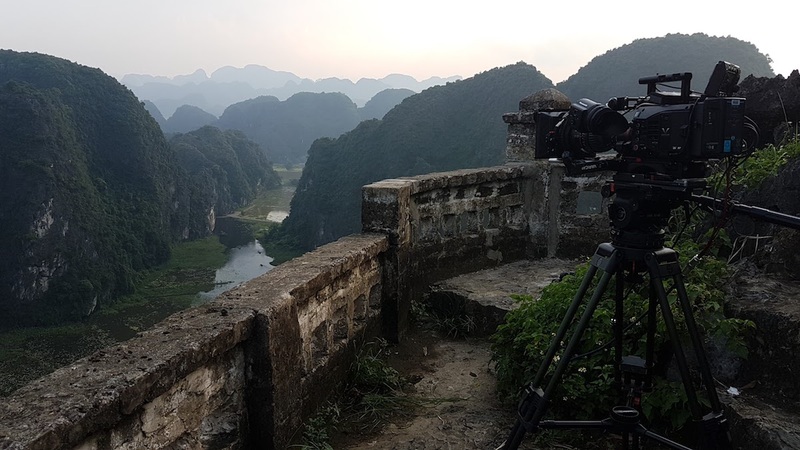 The crew filmed in Vietnam, a country that encompasses the range of the Sunda and Chinese pangolin. Over two weeks we travelled from the jungles of Vietnam to the bustling cities of Thailand and China, culminating with Maria’s meeting with Angelababy, one of China’s biggest megastars. It was hard to comprehend just how famous Angelababy is in China, but arriving into the airport and seeing her face plastered on billboards gave us a sense of her influence. In person was very friendly and relaxed, and she and Maria instantly bonded over their affection for pangolins and the adorable footage that Maria shared of Honey Bun. This meeting initiated an amazing collaboration. WildAid’s previous campaigns had featured footage from police raids, showing injured and distressed pangolins. Maria’s relationship with Honey Bun offered them unique access to film a healthy pangolin in its natural habitat. They worked with Maria to produce a campaign video and when it launched online over 25 million people in China watched it on just the first day. Honey Bun was sometimes more interested in the crew than posing for camera. 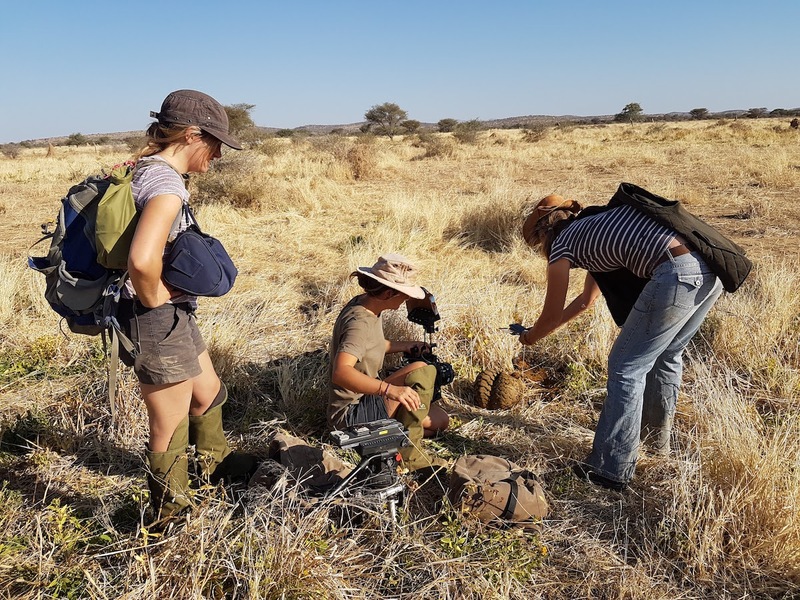 It’s surreal to think that the same Honey Bun that we had spent hours following and filming quietly in the Namibian bush is now a part of an international effort to save her kind. She seems to have taken it in her stride! Victoria began her career in television as a Production Assistant for the BBC’s Natural World series. Since then she has spent almost a decade working on nature documentaries, recent credits include a BBC/PBS landmark series on Mexico (2017) and Planet Earth II. She loves telling stories of how people interact with nature.